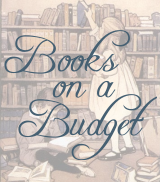 Excellent Sale on Jim Hodges Audio Books at Library and Educational Services! Library and Educational Services is having a great sale on Jim Hodges' wonderful selection of G.A. 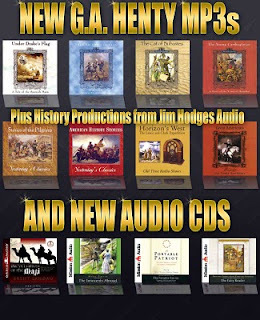 Henty and other classic history audiobooks! The regular retail price on these is $25.00 and they are currently on sale for $12.50, plus only $1.95 shipping on orders over $70.00! The sale ends on Thursday, Nov. 18, but even if you miss this sale the Library and Educational Services price on these is only $14.74, so still quite a savings! 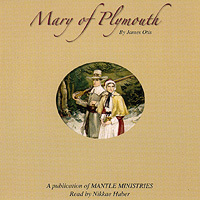 "My name is Mary, and I am setting down all these things about our people here in this new world, hoping some day to send to my dear friend, Hannah, who lives in Scrooby, England, what may really come to be a story, even though the writer of it is only sixteen years old, having lived in Plymouth since the day our company landed from the Mayflower in 1620, more than eleven years ago." You can read the rest of the classic children's book online here. There are several formats to choose from and the "Read Online" option has the text nicely laid out as though you were looking at an open book. Just click to turn the page! The book also has a lovely assortment of illustrations throughout. This book is also available as an audio book (which our family is currently enjoying!) from BlueBehemoth.com. Stories of the Pilgrims Audiobook on Sale This Month! 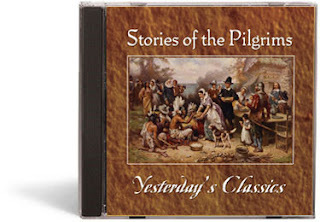 The classic children's book Stories of the Pilgrims is also available as an audiobook recorded by Jim Hodges. You can download the unabridged book (including an e-text file of the book) this month for $15.00 (40% off)! We love this book and were so moved while reading through it last year by the bravery, faithfulness and trust in the Lord shown by the Pilgrims that we named our baby girl Priscilla after Priscilla Mullins. Highly recommended!